This week news came out about the upcoming payment of interest to Yale University on a perpetual bond issued in 1648 by a Dutch water authority, the Hoogheemraadschap van de Lekdijk Bovendams. Next week its legal successor, the Hoogheemraadschap Stichtse Rijnlanden, will pay the sum of € 136,20 ($ 154), the interest over twelve years. Yale’s Beinecke Library bought the bond in 2003 as a cultural artefact. Not only Bloomberg brings this news item which attracted quickly attention at Twitter, but elsewhere, too, this news has been noticed, for example at the Indrosphere blog by Indrajit Roy Choudhury. On my blog I have devoted some space both to the history of water authorities and the history of shares and stocks, and thus it is logical to write here also about this particular story. At the website of the Stichtse Rijnlanden it becomes soon clear how this modern water authority is responsible for a much larger area than only the lands adjacent to the Lek, a branch of the Rhine in The Netherlands, for which the old hoogheemraadschap had been founded. The website of the Regionaal Historisch Centrum Rjnstreek en Lopikerwaard, the regional archive at Woerden, offers a concise history of this institution. In 1285 a dam had been placed in the Hollandse IJssel to prevent the water of this river to stream into the Lek near the village of Vreeswijk, now a part of Nieuwegein. After floodings in this region of the diocese Utrecht due to neglect of this dam bishop Jan van Diest published in 1323 an ordinance for its maintenance. The schouwbrief of 1323 was followed by more instructions, in particular by ordinances published on behalf of Charles V in 1537. “Bovendams” means “ahead of the dam”, in this case up to Amerongen, to the east, 33 kilometers. From the dam westwards another water authority came into existence dealing with the Lekdijk Benedendams up to the town of Schoonhoven. The article in Dutch points to a number of modern studies concerning this water authority. Pride of place should go to an older study by legal historian Marina van Vliet, Het Hoogheemraadschap van de Lekdijk Bovendams: een onderzoek naar de beginselen van het dijkrecht in het Hoogheemraadschap, voornamelijk in de periode 1537-1795 (Assen, 1961). Its long title mentions not only the hoogheemraadschap, but also the term dijkrecht, dyking law. Marijke Donkersloot-de Vrij, a specialist in the field of historical cartography, edited the volume of essays De Stichtse Rijnlanden: geschiedenis van de zuidelijke Utrechtse waterschappen (Utrecht, 1993). The most recent major study, Ad van Bemmel’s De Lekdijk van Amerongen naar Vreeswijk: negen eeuwen bescherming van Utrecht en Holland (Hilversum, 2009) stands out for its colourful photography. In the media the news about the payment to Yale University was received with some smiles. Does this institution really need this small sum? The Beinecke Library is this year closed for a major renovation and will open only in Fall 2016. Nowadays it is not easy to work on a building site and stay firmly within your budget, and thus even this Dutch payment can be most welcome. Incidentally when you check the collections website of the Beinecke Library it becomes clear that this record (Gen. Mss. File 565) was a gift from the International Center for Finance at the Yale School of Management in 2009, a statement which seems to contradict the assertion at Bloomberg about Yale paying $ 24,000 in 2003 to acquire this bond. The bilingual website Beursgeschiedenis/Exchange History has a short article showing the 1648 bond is not the oldest surviving one from this hoogheemraadschap, but one from 1624, since 1938 in the possession of the New York Stock Exchange, thus one of the oldest surviving shares worldwide. The 2,5 percent interest yields even today 15 euros. The bonds of 1648 were issued specifically to build a krib, a pier in the Lek near the hamlet of Honswijk, now situated within the municipality Houten. Maintaining such piers and fighting against piers and other structures at the other side of the river kept the hoogheemraadschap busy for centuries. You can download the archival inventory from the website of the RHC Rijnstreek en Lopikerwaard (PDF, 74 MB). Like other Dutch water authorities the hoogheemraadschap was an independent authority which could proceed in court against for instance the counts of Culemborg or the States of Guelders. The website for the history of stock exchange does call to attention the fact that even the counts of Holland and the bishops of Utrecht, in medieval times often deadly enemies, both invested money in the maintenance plans of water authorities. Some elements in this week’s story need elaboration. You can shake your head in disbelief about a rich university welcoming a payment of just over one hundred dollars, but you might also marvel at the fact of the longevity of institutions vital for the protection of areas threatened by the powers of mighty rivers or seas. Issuing perpetual bonds or rents was not an invention of the Dutch Republic. 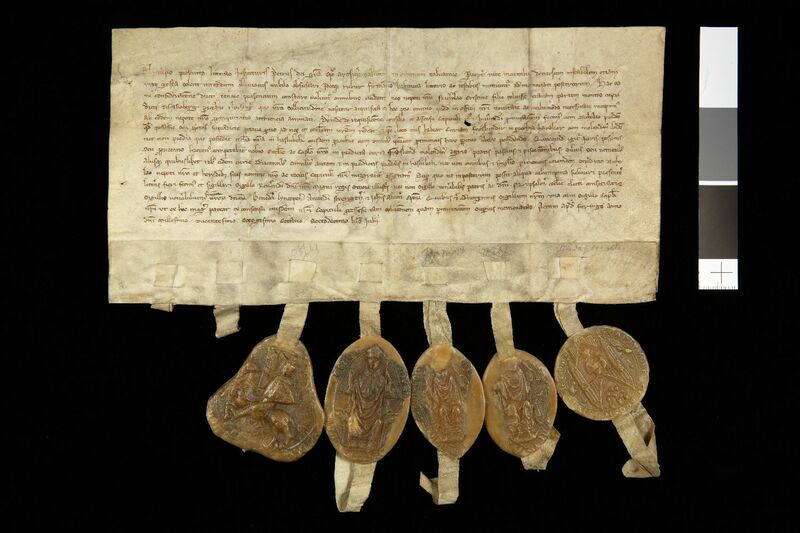 Medieval rents issued by cities are documented for regions such as Tuscany and Flanders since the thirteenth century. Water authorities could levy taxes to get money, but these taxes were meant to cover the costs of normal maintenance. To my surprise I found the archival collections of both the water authorities for the Lekdijk Bovendams and Lekdijk Benedendams in the regional archives at Woerden. The archival inventory (finding aid) for the Lekdijk Bovendams had been created in 1980 at the former provincial archive in Utrecht, but a few years ago it was decided to bring a large number of archival collections kept at Het Utrechts Archief to regional archives in the province of Utrecht, and thus you can find currently materials much closer to their origins at Amersfoort, Breukelen, Wijk bij Duurstede and Woerden. Luckily there is a nifty search site for archives in the modern province Utrecht, the Utrechts Archiefnet, but precisely archival records kept at Woerden can only be searched online at its own website. Interestingly the banner of the Utrechts Archiefnet shows a map with at the bottom the Hollandse IJssel and the Lek. At its collections website the Beinecke Rare Book & Manuscript Library shows for the 1648 bond not an image of the original bond but only the modern talon, the leaflet with notes about payments of interest. The Beinecke’s inventory record gives only the immediate provenance of this bond; information about its earlier provenance is absent. The portal Discover Yale Digital Content does list the bond, but precisely for the original document at first no image seemed available. It took me some time to realize that Stichtse Rijnlanden provides with the news item on its website a direct link to the image at the Beinecke Library. It appears a second record (!) for the original bond has been filed as “Lekdijk Bovendams [water board bond]“, with as signature “Uncat. MS Vault File”. What shall I say here about the double records for the twin items? I suppose we witness the archivists and librarians at work. It is instructive to see at one hand a very detailed indication of subjects using LC Subject Headings, and in the other record just “Business records” and “Certificates”. The more general description gives you the precise dimensions of both items, and the other one has already been included in Yale’s Orbis general library catalog with a cautious remark “In process-material”. It will be a challenge to merge both descriptions into one record. It will be necessary to look at the back of the bond to decipher ownership indications and to confirm the information of the talon: the verso has a note that in 1944 an allonge was issued. The names of former owners are faded or crossed out, and I cannot decipher them quickly, too. “J.J, de Milly” is clear, as is a note about the States of Utrecht from 1652. Dealing with such dorsal notations is one of the goals for which the historical auxiliary sciences have been developed. In fact Yale might consider bringing these items to the Rare Books Room of the Lillian Goldman Law Library, a fitting place for a document with clearly not only a cultural value but also connections to legal, economic and financial history. How shall we sum up the results of this post? This week’s news item can easily be expanded. 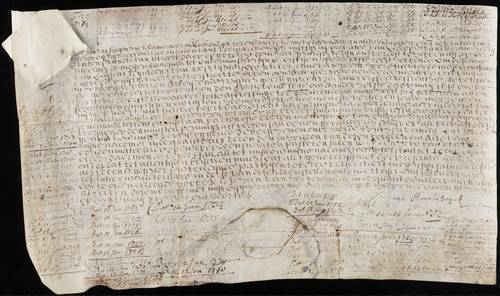 At PrefBlog I read a nice rejoinder pointing to a sale in 2000 at Christie’s in New York of yet another payable bond issued by the Lekdijk Bovendams in 1634 which was sold for $ 47,000, twice as much as Yale paid in 2003 for their bond. A genealogist tracing the history of the Van Blanckendael family also came across the 1634 bond and asked the regional archives in Woerden about the perpetual bonds. The RHC Rijnstreek en Lopikerwaard responded in 2011 drily that the archive of the hoogheemraadschap Lekdijk Bovendams contains several obligations from 1624 and 1638, and even from 1595. However, these obligations are not payable anymore, with two cuts in the document they have been cancelled. Not only national governments, cities and commercial companies issued rentebrieven, perpetual bonds, but other authorities, too, benefited in the past from the capital market. Safeguarding the densely populated Netherlands is still the business of the Dutch waterschappen and hoogheemraadschappen. The one for the Lekdijk is remarkable because it dealt only with the dykes along the Lek and Nederrijn, not with the polders inside Utrecht. It literally pays to have institutions created only for this purpose. Regions afflicted in recent years by river floodings in other countries can tell you about the disastrous impact of neglected dykes. A few years ago the village of Wilnis in my own province Utrecht was hit unexpectedly by a flood caused by a dyke that imploded during hot summer weeks without any rain. The etymology of Wilnis, “wildernis”, wilderness, might wryly serve as a warning of what can become of areas struck by the forces of water running freely. Last but not least there is the matter of describing, conserving and storing archival records stemming from abroad in orderly fashion. The libraries at Yale University contain an astonishing wealth of materials from all over the world, and most often one can only admire the sheer skills in making them useful and accessible for the scholarly community at large. Last week the Findit search website was launched for sarching digital images at Yale University Library, with a clear notice that seven other digital collections at Yale are to be searched separately. Perhaps the double efforts for the rare still active Dutch bond are a blessing in disguise, even if it shows uncoordinated work. Maybe it is a case of not getting in touch immediately with scholars at Yale who could have saved the librarians and archivists from this situation. Years ago librarians at Munich taught me the fifteen minutes rule for cataloguing: when you cannot figure it out within a quarter of an hour, stop and get help. Getting things right is a hard thing to do. In this case scholars at Yale Law School and its marvellous library would have been most happy and willing to assist, and when necessary they would not hesitate to ask for help from all over the world, in order to bring light and truth true to Yale’s motto Lux et Veritas. David Schorr commented at the blog Environment, Law and History on September 21, 2015, my statements about the unique independent character of Dutch water institutions. In particular irrigation districts, too, tend to be independent institutions. I should have been alarmed by my own use of the notorious word unique! The next thing to question is the way such institutions carried out their jurisdiction. Some Dutch waterschappen had in principle the right to inflict the death penalty for not complying with their ordinances. The blog of David Schorr, Adam Wolkoff and Sarah Mikov is well worth following. Yale Insights published in 2007 an interview ‘What is a long life worth?’ with William N. Goetzmann and K. Geert Rouwenhorst confirming the purchase of the bond at an auction in 2003. They tell something about other loans and perpetuities. Goetzmann edited the essay volume The origins of value. The financial innovations that created modern capital markets (Oxford, etc., 2005) covering the history of loans from Babylon to modern times, where you can find an article by Goetzmann and Rouwenhorst, ‘Perpetuities in the Stream of History. A Paying Instrument from the Golden Age of Dutch Finance’ (pp. 177-187) dealing in detail with the 1648 bond. The Yale School of Management has created an online exhibit on the history of securities, Origins of Value. You can consult online an interesting bachelor thesis by Mark Hup, Life annuities as a resource of public finance in Holland, 1648-1713. Demand- or supply-driven? (B.A. thesis Economics, University of Utrecht, 2011) (PDF). This entry was posted in Landscapes and tagged Archives, Commercial law, Cultural heritage, Economic history, Legal history, Netherlands, Water control on September 18, 2015 by rechtsgeschiedenis. Is it old-fashioned to focus on the lives of individual lawyers or is it old school thinking to focus on them as a group? A nice synthesis worthy of Hegel would try to bring the study of a particular profession and biographical studies together within a new framework. Anyone studying the great and small legal humanists of the sixteenth century has to face the fact that the subjects of their research walked both the legal roads of this period and the paths of humanist scholarship. They focused on many aspects of history with a predilection for Classical Antiquity, its languages and sources. French lawyers were very visible in this field. In this post I would like to look at some online resources in France and elsewhere which help fostering the study of their works, lives, activities and surroundings. Some scholarly projects have helped enormously to become aware of the sheer number of people involved with legal humanism. At the very heart of humanism were manifold contacts, often by letter, which crossed the borders of countries and languages. Letters in impeccable Latin following the models of Antiquity served not only as means of communication, but also as shining fruits of the mind. Perhaps the ultimate accolade was writing to and receiving an answer from Erasmus. He and his correspondents were fully aware that their letters were bound to be copied and made public. In a sense remarkably close to the sharing of information on the web in our time the republic of letters of the sixteenth century was a very open society, too. P.S. Allen’s edition of Erasmus’ letters [Opus epistolarum Des. Erasmi Roterodami (12 vol., Oxford 1906-1958; reprint Oxford 1992)] was and is the single most influential project to stimulate research on Erasmus and his contemporaries. Since a couple of years Allen’s edition and the old Opera omnia editions of Erasmus’ works are being digitized at Erasmus Online. The volumes of the modern Opera omnia have been already digitized, and can be downloaded as PDF’s at OAPEN. Translations in English and Dutch are among the modern projects to make them even more accessible. At the website of the Warburg Institute you can find a fine overview of the major projects for the edition of letters by humanist scholars, including online inventories and editions, and a useful bibliography. The volumes of the biographical dictionary Contemporaries of Erasmus. A bibliographical register of the Renaissance and Reformation, Thomas Deutscher and Peter Bietenholz (eds.) (3 vol. Toronto 1985) help to survey this intricate web of contacts by letters and other writings. However interesting in itself, letters form here the stepping stone to law. Letters and humanists are the very heart of the project in the center of this contribution, Les Bibliothèques Virtuelles Humanistes (BVH), the Virtual Humanistic Libraries, a project hosted by the Université de Tours. The multiple form bibliothèques draws attention to the presence of materials from several libraries in the Loire region, mainly those at Blois, Bourges, Châteauroux, Tours and Orléans. At the heart is the project Epistemon which started in 1998 for editing and searching humanist texts, in particular letters. The BVH now is home also to texts by humanist scholars, both in digital version and only as text, notarial acts from Tours and manuscripts. An accompanying blog keeps you informed about the latest developments. The section on iconography helps you find images with Iconclass, including some portraits of authors. In the project MONLOE of the BVH copies of the early editions of Michel de Montaigne’s Essais, Montaigne’s own annotated copy of this work and other books, letters and manuscripts with his notes are being digitized. In May 2013 Ingrid de Smedt (University of Warwick) detected in the Herzog-August-Bibliothek Wolfenbüttel a manuscript (Cod. Guelf. 7. 1. Aug. 4to; digitized at Wolfenbüttel) with notes made in 1561 of lectures by François Baudouin (1520-1573) on Roman law and on the title page an owner inscription by Montaigne (1533-1592) (“Michael Montanus”). This manuscript was in fact the first to be tracked down as undoubtedly stemming from the personal library of Montaigne. Montaigne was between 1556 and 1570 a councillor in the Parlement de Bordeaux, one of the mighty provincial courts in Ancien Régime France. The BVH cooperates with the ARTFL project at the University of Chicago, where you will find also a searchable database of the first editions of Montaigne’s Essais, including the famous annotated copy of the edition Bordeaux 1588. Many texts in the BVH can be interrogated with Chicago’s Philologic tool. The University of Chicago maintains a website for Montaigne studies, with apart from digitized early editions a number of current bibliographies. The blog of the BVH is hosted by the French platform Hypotheses. In fact an announcement at another blog on Hypotheses, Francofil, made me look again at the BVH. A second reason to delve into French digital libraries was the change of address of the digital library of the university of Strasbourg, now named Numistral, and the launch of Numelyo at Lyon. A quick search at Numelyo in its section Provenance des livres anciens brought me to a copy of Sueton’s Lives of the Caesars (Venice: Zani, 1500) (Rés. Inc. 1114) with an inscription that might also be by Montaigne. Law is not absent at the website of the BVH. I found with the advanced search form for digitized copies with the domaine “droit” 54 books. Among them you will find for example Louis Charendas le Caron, Pandectes ou digeste de droit françois (…) (Lyon: Veyrat, 1597), editions of coutumes, customary law, commentaries on Roman and French law by authors such as Jean de Coras, Jean Imbert, Jean Papon and Pierre Rebuffi. One of the most often printed works is present, too, the Annotationes in Pandectas of Guillaume Budé (1467-1540), in an edition Paris 1543. Nobody should use these editions of Budé’s magnum opus without reading first the articles by Douglas Osler, ‘Budeaus and Roman law’, Ius Commune 13 (1985) 195-212, and ‘Turning the title page’, Rechtshistorisches Journal 6 (1987) 173-182. Budé changed consecutive editions of this work substantially. It would be rash to rely on just one (digitized) edition which you happen to find. Guillaume Budé’s name is used as an acronym, BUDE, for the online searchable database documenting the transmission of classical and medieval authors in manuscripts from the fifteenth to the mid-seventeenth century at the Institut de recherche et d’histoire des textes in Paris and Orléans. Another famous French humanist, Jean Bodin (1529-1596), is the subject of The Bodin Project, a very useful portal at the University of Hull. 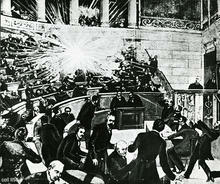 Bodin studied Roman law at Toulouse and worked ten years as an attorney at the Parlement de Paris. On this portal you will find links to digitized versions of contemporary editions of Bodin’s major works, bibliographies and links to other relevant projects. Particular mention should be made of the source indexes for some of Bodin’s works. Digitized versions of three sixteenth-century editions of Bodin’s works, too, are present at the BVH. One of the reasons I wanted to look more closely at the BVH project was in fact a misreading. I thought I had seen an announcement on this website about the digitization of a treatise on money valuation by Jacques Cujas (Cuiacius) (1522-1590). Cujas studied law in Toulouse, taught there and more famously at Bourges. It turned out to be a text by Jacques Colas, Suputation nouvellement faicte de la valeur de monnais et des abuz dicelles, a manuscript from 1557 (Orléans, Bibliothèque municipale, Fonds ancien, ms. 629). Cujas is actually absent on the shelves of the BVH. Now Bodin was one of the authors in the sixteenth century writing about monetary issues. He is credited with an early exposition of the quantative theory of money in his 1568 treatise Réponse au paradoxe de M. de Malestroict touchant l’enchérissement de toutes choses, et le moyen d’y remédier. The website at Hull points to a digital version of the Bibliographie critique des éditions anciennes de Jean Bodin by Roland Crahay, Marie-Thérèse Isaac and Marie-Thérèse Lenger (Brussels 1992), where you can quickly find detailed information about the editions and existing copies of this text and other works by Bodin. In the case of the Réponse your attention will be drawn also to translations in Latin and German. The Latin version first appeared in a collection of monetary tracts and consilia (legal consultations) with the title De monetis et re numaria edited by Reinier Budelius (Coloniae Aggripinae: Gymnicus, 1591; digitized at the University of Ghent). Among the other texts in this volume are two consilia on cases which centered around monetary devaluation by Nicolaus Everardi (around 1462-1532), a Dutch lawyer who became famous for his Topica sive de locis legalibus liber, a work on juridical argumentation. Everardi’s texts can be found at pages 689 to 701 of Budelius’ edition. Chris ten Raa published a study on Consilium nr. 105 van Nicolaas Everaerts (Rotterdam 1978). No version of Bodin’s monetary treatise is present at the BVH or at The Bodin Project. I have looked for digital projects concerning other French sixteenth-century legal humanists such as Hugues Doneau (Donellus, 1527-1591), François Hotman (Hotomannus, 1524-1590), François Douaren (Duarenus 1509-1559), Denys Godefroy (Gothofredus, 1549-1622) and Jacques de Thou (Thuanus, 1553-1617), but until now I found only for François du Jon (Franciscus Junius, 1545-1602) a digital project, The Junius Institute at the Calvin Theological Seminary in Grand Rapids, MI. Musing over the issue of digital versions I realized that a search for the works of French sixteen-century lawyers would make an excellent test case for the Universal Short Title Catalogue (USTC), a project hosted at the University of St. Andrews with French books printed until 1600 as its original core. In October 2013 a new version of the USTC website was launched. The project is an ambitious companion to other short-title catalogues such as the ISTC for incunables, the ESTC for English books (1473-1800), the STCN for the Netherlands (1501-1800) and STCV, its Flemish counterpart. The bibliographical information for the works of Bodin makes a fine example. For this project copies of French books have been inspected and described at many libraries. Supplementary information from other bibliographical works is summarily indicated. For the monetary treatise its existence in print thanks to and literally as a companion to a tract by Jean Cherruyt, seigneur de Malestroit, is duly noted. Mistakes do occur in the USTC. I do not think that a rare 1509 treatise Repertoyre et table tres exquis et familiers selon l’ordre des lettres de l’abc was written by our Jean Bodin. The first edition of the Topica by Nicolaus Everardi (1516) is ascribed to one of his sons, the poet Nicolaus Grudius, himself a brother of the more famous Neolatin poet Janus Secundus. In my Ph.D. thesis defended in 1994 I could already indicate rather more copies, and it is easy to add references to digitized copies of the first edition in 1516 and later editions in the Digitale Sammlungen of the Bayerische Staatsbibliothek in Munich; in a post on this blog I give further information. Better than deploring these faults – or any omission – is simply realizing the history of the USTC’s primary focus on France still has consequences. However, it seems at first strange to find exactly one work by Cujacius, but when you look for Cujas, his name in French, you will find rather more! For the rest one can place questions marks about the tagging of Bodin’s treatise in the USTC. In most cases an edition of this treatise has the classification “Economics”, in one case “Jurisprudence”. It goes without saying that the USTC does indicate digitized copies in a fair number of cases, but it is not an all-embracing repertory of digitized books published in the sixteenth century. The USTC can show you other things or lead to interesting questions. If you search for works on economics you will find a surprisingly large number of works written either in Dutch or coming from the Low Countries. In my view the USTC can help you framing and refining questions about the use of language, the large number of works published in a specific period or on a particular subject, or the favorite format of books. In an ideal world you could perhaps add a second preset field to distinguish among subjects for the classification “Academic dissertations”. The indication of languages for this class is unfortunate when for example a dissertation defended in Italy and written in Latin is nevertheless classified as Italian. It seems wise to use the resources of the USTC as an additional tool, and not as your only source of information, something which is anyway for any resource only seldom advisable, and as always you will have to check the information it provides. The BVH and the USTC are just one of the gateways you might like to use to find digitized books of French humanist lawyers. On the page for digital libraries of Rechtshistorie, my legal history website, you will find links to some twenty French digital libraries. Some of them offer quick access to sources on general themes such as legislation, jurisprudence, verdicts (arrêts), customary law, consultations and legal dictionaries. In particular the – also recently restyled – portal Fontes Historiae Iuris (Université Lille-2) is very helpful for quick orientation, even when the digital editions have sometimes been poorly scanned at Gallica. Let’s smile about the statement that you will not need to look any further! For some regions special websites bring you to the coutumes, the customary law, with often both the texts of these resources and learned commentaries on them. At Bibliopedia you can find a very detailed list of French digital libraries, but alas without the majority of websites dedicated to the history of French law. In 2011 I wrote two posts on French legal history with a somewhat closer focus, the first on the law of Normandy, the second on a number of research institutions in Paris which are relevant for legal historians. A service akin to Fontes Historiae Iuris for French legal history, but on a wider scale, is provided by the Post-Reformation Digital Library (Calvin College and Calvin Theological Seminary), a portal to digitized works by protestant authors. It contains for a substantial part links to books digitized elsewhere, and it has a nifty function for searching simultaneously with one action in a number of digital libraries. Other portals will help you as well to track down digitized versions of Early Modern books, for example Early Modern Thought Online of the FernUniversität Hagen, and the Philological Museum maintained by Dana Sutton (University of Birmingham). Another gateway for online resources concerning Early Modern History has been created by Sharon Howard (University of Sheffield). Her portal Early Modern Resources is truly impressive in its wide range and coverage of aspects of European history between 1500 and 1800. Critics who scold some of these enterprises for their incompleteness, omissions and faults can seem to be hunting themselves for a utopian illusion, the One and Only Source of All Knowledge. French humanist lawyers did not live as recluses, isolated from the turbulent times around them. They did not stick with texts as they happened to look in print, but delved into the background. Ad fontes was one of their favorite mottos. In Reformation Europe they simply could not hide completely from all influences and developments in religion, politics and society. Scholars from other countries, too, came to France to join their efforts. As lawyers they rubbed shoulders with their colleagues in the field of law and justice. Their research into Roman law and other subjects of Classical Antiquity did not happen in an ivory tower. In this century we face the opportunities offered both by portals and by online resources themselves to acquaint us deeper than ever before with a world of five centuries ago with all its differences from and resemblances with our times. For your convenience it is worth knowing the separate website of the MONLOE project, (Montaigne à l’Œuvre) where you have quick access to the resources at Tours concerning Montaigne, including for example the 47 arrêts of the Parlement de Bordeaux for cases dealt with by Montaigne between 1562 and 1567 as a member of this judicial court. For Cujacius one can benefit from the recent study by Xavier Prévost, Jacques Cujas 1522-1590, jurisconsulte humaniste (Geneva 2015). Montaigne’s Library is a digital collection within the Cambridge Digital Library with books collected by Gilbert de Botton to recreate Montaigne’s own collection of books. Some of them are indeed his personal copies. Only a few works in it touch upon legal matters. This entry was posted in Scholars and tagged Digital libraries, Early printed books, Economic history, France, Legal history, Legal humanism on October 23, 2013 by rechtsgeschiedenis. While following these days the news on the actions of the European Union to help the economy of Cyprus by taxing the savings of those who had hoped that they had found a safe haven I could not helping trying to see these events in a historical perspective. Was this the first action of its kind? How typical was the role of banks and the banking system in the Mediterranean world? How to find information about the history of money since Classical Antiquity? Numismatics is the historical discipline that traces the history of both coins and paper money, monetary objects and medals, the history of mints and much more. By sheer luck I had been alerted earlier this month about a very useful Italian blog post with a summary guide by Lucia Travaini to important numismatic websites. With one exception money museums are not present in her brief guide. Remembering the difficulties and surprises last year in creating a sensible webpage on museums and legal history I decided to create space for money museums, and to write about the way to reach this goal. Looking for Cyprus and Cypriote coinage offers a chance to test the quality of the information I found. Numismatics as a historical auxiliary science has not the same attraction for historians as for example palaeography, the science dealing with old scripts and handwriting. Of course being able to read old handwritten texts is most useful, but not looking at coins is excluding arbitrarily material objects with their own history, impact and significance. Unfamiliarity and downright depreciation explain part of the minor position often allotted to this discipline. Numismatics has been looked upon unfairly as a hobby-horse for people with only antiquarian interest, something suitable for connoisseurs and collectors, or as at best a small branch of art history. In fact the uses of auxiliary disciplines are multiple. A first practical distinction is that historians do not receive the same training in numismatics as they get – or are expected to get – in fields such as palaeography, diplomatics, heraldry, epigraphy and sigillography. For periods in which written records are not as abundantly present as for contemporary or Early Modern history the importance of sciences dealing with objects and artefacts gain importance. Epigraphy and numismatics tend to be less distant for historians dealing with Classical Antiquity. It is not possible to sketch in just one post a concise history of money, even when you restrict yourself to numismatics. The pocket online guide of Lucia Travaini will serve as a starting point. At her website is more space to introduce her scholarly qualities. By the way, the Bibliostoria blog of the Biblioteca di Scienze della Storia of the Università degli Studi di Milano where Travaini published her guide gives you excellent information on new and less recent online resources for historians. The first resources mentioned by Travaini are image databases. McSearch, the Medieval and Modern Coins Search Engine, brings you quickly to literally hundreds of images of Cypriote coins sold at auctions. At CoinArchives.com you find similar information, with, however, for Cyprus less results. Wildwinds is a more ambitious site where the origin and present value of coins can be assessed. This site points also to other online collections and to the Digital Library Numis, on which I will comment later. Travaini puts a number of numismatic societies in a second section of her guide. For the American Numismatic Society she mentions the online bibliography of numismatic literature, but the ANS offers more digital resources, including a selection of links to mints worldwide, a list of money museums, and lists of numismatic societies, virtual collections, online search tools, discussion groups and periodicals, information which in my opinion makes this website a portal for numismatic studies. International cooperation between money museums is represented by ICOMON, the International Committee of Money and Banking Museums, an initiative of the ICOM federation of museums worldwide. Some ICOM committees offer an overview or even a database of relevant museums, but ICOMON has not yet created any substantial list on its website. At present the board of ICOMON is led by a Dutch chairman, Christel Schollaardt of the Geldmuseum in Utrecht, and by Elena Zapti from Cyprus as its secretary. So far Travaini’s guide brings us quickly to the most relevant institutions and resources. The section with online catalogues of specialized institutions is disappointing, with only the catalogue of the Museo Bottacin in Padova. Are online catalogues of money museums indeed rare to find? When writing this post I could not access the library catalogue of the Dutch Geldmuseum in my own home town Utrecht. Instead of complaining about this unfortunate situation I should redeem it somewhat by pointing out that the Geldmuseum founded the International Network of Numismatic Libraries (INNL). At its website the INNL gives a substantial list of numismatic libraries and their library catalogues all over the world. For Italy the Civica Biblioteca Archeologica e Numismatica at Milan (!) is listed, with a library catalogue which is integrated into the central catalogue of specialized city libraries. As for the Museo Bottacin in Padova this is a department of a larger museum. In Italy and elsewhere many museums have a numismatic department. The website Musei Numismatici Italiani lists fourteen museum departments and independent museums in Italy. It seems useful to include here at least the Museo della Zecca in Rome and its online database, and the database Iuno Moneta at the Portale Numismatico dello Stato. Online numismatic collections are the subject of the next section in Travaini’s guide, but here her definition of collezioni online is not clear. Both the links to the Museo Civico Archeologico, Bologna, and Dumbarton Oaks in Washington, D.C.,, do bring you only to webpages concerning collections, but not to collection databases such as those of the Fitzwilliam Museum, Cambridge, and Princeton University; the link given by Travaini, however, is not to the database of Princeton, but only to the webpage of its numismatic collection. Both at Bologna and Dumbarton Oaks there is no online database for coins and medals. Perhaps it is wise to say at this point that whatever faults or omissions the guide of Lucia Travaini may have, it certainly brings you to many important and reliable resources. It is courageous to present any guide in a nutshell, and here weaknesses in some sections have to be seen in the light of the other sections. I would not have thought about listing links to websites concerning coin findings. Travaini points to the Swiss website Coin Findings which has four URL’s depending on the language you want to read, English, French, German or Italian, and to the Corpus of Early Medieval Coin Finds, 410-1180 for the British Isles of the Fitzwilliam Museum. In the last section of her guide Travaini lists a small number of thematic portals and bibliographies. Here the bibliographic website of Hendrik Mäkeler (Myntkabinett, Uppsala) concerning both ancient and medieval coins offers even more than just a fine bibliography which can be accessed in English, Swedish and German, but an exhaustive portal with links on any subject ranging from individual scholars, money museums and collection databases to the coin trade. Numismatik.org is a portal created by the Swiss scholar Benedikt Zäch. It incorporates the webpages of the International Numismatic Council with good information about current events. One of Zäch’s special subjects is coin findings. This Swiss portal owes its existence certainly also to the vicinity of the Münzkabinett Winterthur. The last portal Travaini mentions is the Digital Library NUMIS which in a very efficient way present a collection of (mainly links to) digitized publications. By now you may wonder about two questions. Will I look here at the monetary history of Cyprus at all? How do I proceed with creating my own list of museums concerning the history of coins, medals and paper money? Before answering these questions I want to point out a weakness in just looking at specialized institutions for monetary history. Coins and medals have been collected in great quantities by some of the world’s largest museums. In particular the links listed by the American Numismatic Society and by Hendrik Mäkeler contain these collections, but in a list on the English Wikipedia the information is supplemented with the number of coins which makes clear these institutions form a class of its own. Moreover, in these collections you will find in particular ancient coins from the Mediterranean. If you want to find early coins from Cyprus you are wise not to forget to look in their collections. Thus it might be surprising to know that the Smithsonian Institution has more than 1,600,000 coins and medals in the holdings of the National Museum of American History, Washington, D.C. The Hermitage in St. Petersburg follows with more than a million objects. The Department of Coins and Medals of the British Museum, too, is home to more than one million coins and medals. I cannot help noticing the absence of an online catalogue or objects database on its very useful website, nor do the Smithsonian Institution and the Hermitage. The collection with some 600,000 coins of the American Numismatic Society in New York can be searched online using the MANTIS database. The Münzkabinett of the Kunsthistorisches Museum (KHM) in Vienna does not present an online catalogue of its own holdings – more than 700,000 objects – on its website, but it is home to a number of specialized catalogues for ancient coins and medals such as the Sylloge Nummorum Parthicorum. However, one can find some images of coins easily by tuning the image database of the KHM. The Wikipedia list mentions the Département des Monnaies, médailles et antiques of the Bibliothèque nationale de France. I guessed the Louvre would have a numismatic collection, too, but this is not the case. For the sake of compactness I will not discuss here all collections in this handy list at the Wikipedia, and go to the Numismatic Museum of Athens (NMA). It is a relief to view this very well-organized website with a splendid array of (mainly external) web resources. For looking at ancient coins from Cyprus you will benefit from the Sylloge Nummorum Graecorum, a project of the British Academy. The section on numismatics of the bibliography in the Bibliotheca Classica Selecta, a project at the Université de Liège, is not to be missed. The NMA provides a link to the website Digital Historia Nummorum of Ed Snible with a fine section on Cypriote coins, even though it relies on rather old literature. Some of these works are still valuable. In the Digital Library NUMIS I found among publications from this century also a digitized version of a book-length article by Jan Pieter Six, ‘Du classement des séries cypriotes’, Revue Numismatique, 2e série, 1 (1875) 249-374. In fact this article builds heavily on the collections of the large general museums in Europe, and apart from the collection at Winterthur much less on the collections of specialized independent institutions. 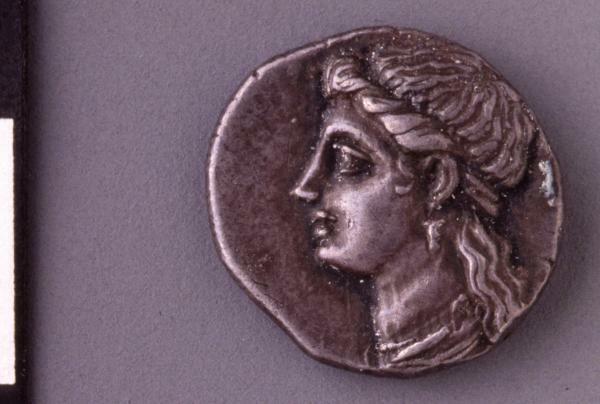 A last link adduced by the NMA is the Art and Archaeology Artifact browser of the Perseus Digital Library, the well-known project of Tufts University, where you can look for coins from ancient Greece. Among the large collections of major European cultural institutions I would like to mention the numismatic collection of the Bode-Museum, now part of the Staatlichen Museen zu Berlin-Preussischer Kulturbesitz. You can find its coins and medals both in the online catalogue of the Münzkabinett, and also among the images at SMB-Digital. In the last paragraph I finally presented some online information about ancient Greek coins with a focus on coins from Cyprus. I have not become overnight a specialist on ancient coinage nor a scholar focusing on economic history, but it is possible to find quickly some reliable roads to the materials and issues you face when dealing with these subjects. Incidentally the NMA cooperated with the British Museum for the Presveis exhibition on the history of European monetary unions before the euro. The links presented and discussed here amount to building materials for a more substantial answer to the initial question about the history of money on Cyprus. With regard to the second question, the creation of a sensible list of money museums, it seems you have to combine information from several resources in order to create a new – and preferably commented – list of money and banking museums. I would like to include links to online catalogues and survey projects, too. As for now the museums list provided by the American Numismatic Society, at the INNL website and by Hendrik Mäkeler present us together a fairly reliable overview of major and minor institutions in the field of numismatic collections. An obstacle for creating a new list is the very low number of museums I detected so far featuring the history of banking. No doubt some money museums do deal with this subject, but few museums focusing more exclusively on banking, banks and their history have surfaced on the websites I visited for this long post. Banks and their history fully merit a new post on my blog, and the crisis of the Cypriote banks is just one example that needs further exploration. I scarcely need to admit it was hard to find a place for legal history in this first post on money and museums. Until that post arrives here you might already profit from the rich links collection on banking history provided by Roy Davies of the University of Exeter. This entry was posted in General and tagged Cyprus, Economic history, Legal history, Money, Museums, Numismatics on March 28, 2013 by rechtsgeschiedenis.